What would be the chances of someone correctly predicting seven events in the future, putting them in the right order, and even setting out when they will occur? That is what we find in Daniel's Prophecy of the Seventy Sevens. Daniel 9:24-27 is truly The Most Amazing Prophecy in the Bible. 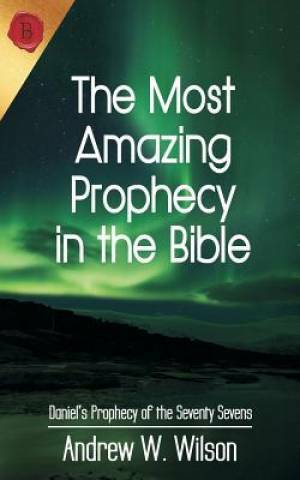 The Most Amazing Prophecy in the Bible: Daniel's Prophecy of the Seventy Sevens by Andrew W Wilson was published by Andrew Wilson in August 2015 and is our 10028th best seller. The ISBN for The Most Amazing Prophecy in the Bible: Daniel's Prophecy of the Seventy Sevens is 9780994397706. Be the first to review The Most Amazing Prophecy in the Bible: Daniel's Prophecy of the Seventy Sevens! Got a question? No problem! Just click here to ask us about The Most Amazing Prophecy in the Bible: Daniel's Prophecy of the Seventy Sevens.